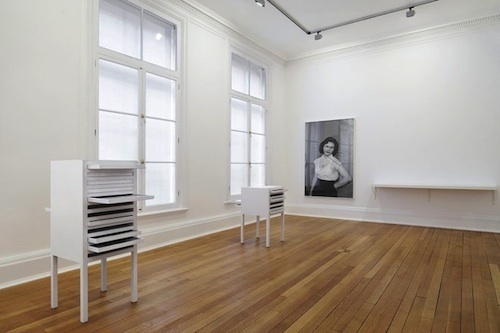 View of “Akram Zaatari: On Photography People and Modern Times,” 2013. For his first solo show in London, Lebanese artist Akram Zaatari has presented two extensive installations—one in each of Thomas Dane Gallery’s spaces—consisting of framed photographs, iPad displays, still images that are incorporated into sculptural casements, and16-mm projections that emphasize the physical presence of the projector. As a cofounder of the pioneering Arab Image Foundation, which was established in 1997, Zaatari has participated in preserving and archiving a collection of more than six hundred thousand images of vernacular and studio photography from the Middle East, North Africa, and the Arab diaspora. This exhibition is based on the foundation’s archive of Studio Sheherazade, created in 1953 by Hashem al-Madani in Sidon, Lebanon. Zaatari acts as an archival artist, surveying social activity as it relates to Lebanese history and the nation’s complicated political readings as well as compiling a vast array of visual and political documents of both collective and personal histories. One example is On Photography, People and Modern Times, 2010: The work features rows of plush red velvet cinema seats, which face a thirty-eight minute projection of still photography that has been animated through digital time-lapse video. Zaatari’s use of time-lapse video provides a narrative, allowing him to subtly indicate the role of the archivist’s interpretation of raw materials. A similar strategy is taken in 28 Nights and a Poem, 2010, which consists of three upright containers—each about the size of an old Victrola stand—with flat display drawers filled with images of lenses, touch-up pens, and X-Acto blades, the tools of old-school photography. In the context of the greater exhibition, these drawers seem almost like miniature museums. Elsewhere, one hears and sees a 16-mm projection juxtaposed with iPad tablets, which complements the artist’s more antiquated references and amplifies the scope of Zaatari’s project.